A cooked breakfast gives you plenty of fuel to see you through until lunchtime. Cut right down on fat by poaching and grilling, and choose meat with a low fat content. Preheat the grill to high and grill the sausages, turning frequently, for 10-12 minutes, or until cooked through so the juices run clear and there is no pink meat. Remove and keep warm in a low oven. Grill the bacon rashers for 2-3 minutes each side until crisp, turning once. Keep warm with the sausages. Grill the tomatoes cut-side up, and mushrooms, stalk-side up for 5 minutes until cooked, turning the mushrooms halfway. Keep warm with the bacon and sausages. Finally poach the eggs. Fill a large saucepan with water to 7.5cm deep. Add the vinegar and bring to a simmer. With the end of a wooden spoon, swirl the water to create a whirlpool. Crack an egg and drop it into the middle. Raise the temperature so that the water bubbles gently. With a slotted spoon, draw the egg white around the yolk. Poach for 2-3 minutes until the yolk is cooked to your liking. Lift the egg out with the slotted spoon and drain on kitchen paper. Repeat with the remaining eggs. While the eggs are cooking, toast the potato farls until golden and warm the beans in a small saucepan. 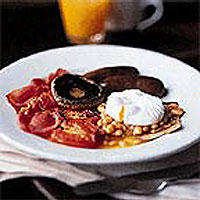 Spoon the beans onto a potato farl, top with an egg and serve with the bacon, sausages, tomatoes and mushrooms.